I promise that Mark’s gluten free sweet and sour chicken recipe tastes exactly like the Cantonese-style dish you probably remember ordering from your local takeaway. The best part is that it’s low FODMAP and dairy free too! Mark’s gluten free sweet and sour chicken recipe has been a favourite on the blog since 2017… so I thought it was only right to come back and update the photos for him! This is one of the first meals Mark ever cooked for me not long after we first met. He really pulled out all of the stops for this one and I genuinely couldn’t believe just how insanely tasty it was! But best of all – it just made me feel normal. Being gluten free so often makes me feel like a ‘problem’ whenever I eat anywhere other than at home. Anyone else feel the same? I have soooo many happy memories of ordering sweet and sour from the local takeaway (plus many, many, many other dishes) and enjoying it with my family in the past. But that was a hell of a long time ago these days! Of course, my Mum, Dad and Bro still order those amazing dishes from the same Chinese takeaway whenever they please! I can basically eat zero things from your average Chinese takeaway and then the whole situation just becomes really awkward. Should they not order from there because of me? Should they order and then I make my own food? Should I just not bother coming when they’re ordering a Chinese?! It’s nobody’s fault, but it’s still so awkward and it just goes to show how being gluten free can affect so much more than just your body. So what’s the solution to that stalemate? Well, Mark has actually started making me my own gluten free AND low FODMAP Chinese takeaway recipes – like his gluten free sweet and sour chicken recipe. So now whenever we go over to my parents or his parents house and a Chinese is being ordered… we bring our own food with us! I know it still seems super-awkward and loads of trouble, but it really is one of the only solutions we’ve come up with. And when the food is this good, I really don’t feel like I’m missing out at all, honestly. Plus, I just feel so lucky that Mark would go through all the trouble of making this for me!!! And he’s actually made me a bunch of different Chinese takeaway dishes over the years to bail me out of awkward situations. Here’s the link to a blog post with them all: 10 gluten free Chinese takeaway recipes you won’t believe you can eat. Oh and I’d recommend making a little extra of the sauce (maybe just double everything) so you can use it to make his gluten free crispy chilli beef recipe 😍 Trust me, it’s so good too! Now, in terms of FODMAP, the only thing you have to be careful of is ketchup. Most ketchup contains onion and garlic, but you can actually get low FODMAP ketchup like this one here. But still bear in mind that you shouldn’t have too much of it – that’s why only a small amount of this sauce is safe during the elimination phase of the low FODMAP diet. Just as a heads up – this recipe does involve deep-frying the battered chicken to get the best crispy coating possible. Just like your local Chinese takeaway would. 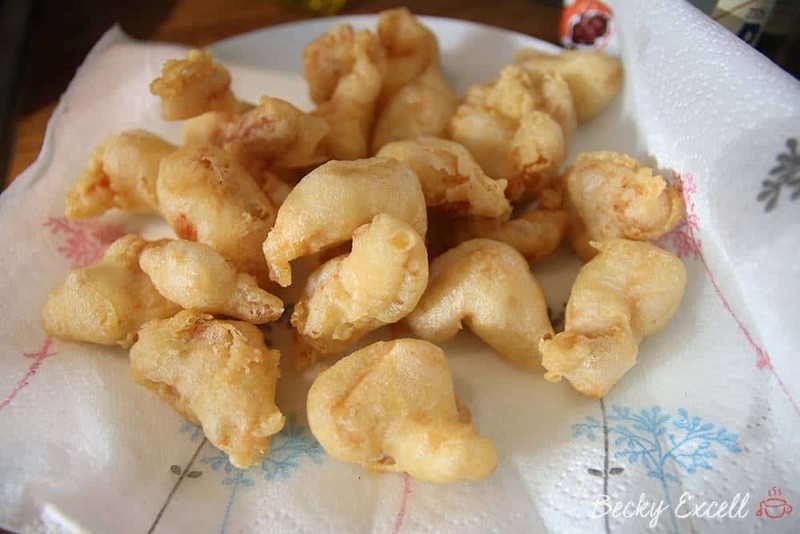 It’s really easy peasy when you know how and you defo don’t need a deep-fryer to do it – it’s all covered in the recipe below with easy instructions. But if you’re not feeling brave (or you just need a sweet and sour in a hurry) you can always use plain chicken breast that you’ve fried and cooked in a separate frying pan. Or M&S’ gluten free Tempura chicken would work really well here too in a pinch. Mark's Gluten free sweet and sour chicken recipe is just like the Cantonese-style dish from your local takeaway. It's low FODMAP and dairy free too! To make the gluten free batter, mix all of the dry ingredients in a bowl and slowly add the water until it's the consistency of single cream (not too thin/watery, not too thick and gloopy). Mix your chopped chicken breast in the gluten-free batter mix until well coated and put to one side. Time to heat your oil. If you don't have a deep-fryer (it's not mandatory!) start by pouring your vegetable oil half way up a medium-sized saucepan. Don't overfill it! Heat this at a medium heat until it reaches 190c or 375f. If you don't have a cooking thermometer then just drop a little batter in occasionally - if it sizzles and browns, it's good to go. If it sizzles but doesn't brown, it's not hot enough. Smoke and violent bubbling means it's too hot! Once it's reached the desired temperature, carefully lower each chicken chunk into the oil one at a time and be wary of splashing the oil. The oil should be lively and bubbling around each chicken chunk, but not noticeably spitting at all. Try to use a slotted spoon to separate them early on if they stick together. After 5 minutes, they should be nice, light and airy and a light, golden colour. Remove them from the oil with a slotted spoon and drain them onto kitchen paper. Repeat until all of your gluten free battered chicken is cooked. Now for the sweet and sour sauce. Start by frying your chopped green and red pepper in a wok using 1 tbsp of oil until slightly browned. In a separate bowl, combine the ketchup, white rice vinegar, sugar and pineapple juice. Add this mix into the hot wok with the peppers and bring to the boil over a high heat. Now add the corn flour mixture, stir and add the pineapple chunks. When the mixture returns to the boil again, add the gluten free battered chicken and serve immediately. * A tenth of the sauce would be a safe low FODMAP serving size on the restriction phase of the low FODMAP diet. * Some people may not like the idea of adding sugar these days, but trust me, it can be mighty sour if you don't! * You don't need a deep-fryer for this recipe, but it probably makes life a little easier. I've personally never owned one. * If using the oil for extended periods, make sure you remove scraps of batter from the oil. Otherwise, they can overcook, burn and produce a lot of smoke. Thanks to Mark for sharing his gluten free sweet and sour chicken recipe! Honestly, this is recipe is seriously the real deal and you won’t regret giving it a try. Did you try out Mark’s recipe? How did it go? Let me know by leaving a comment below or on Facebook / Twitter / Instagram. Oh and don’t forget to pin this before you leave!